Run4joy59's Blog | Ending chaos, creating balance. Where have I been? That’s a good question. I’m still here. I just haven’t been blogging. I’ve thought about it off and on, especially when I read other people’s posts. But I couldn’t seem to find the motivation to do it myself. But today, here I am. I’m still working full time, for the next 528 days. That’s when I can take early retirement. I am so looking forward to that (like you couldn’t figure that out from my countdown, right?). There are days when I’m not sure if I can make it through the next 528 days. I’ve now been diagnosed with rheumatoid arthritis (or rheumatoid disease, which I prefer to call it, because it’s so much more than arthritis), osteoarthritis, neuropathy, and the latest diagnosis, fibromyalgia. No wonder I’m in constant pain. Whew! The fibromyalgia diagnosis came about the last time I saw my rheumatologist. I told her that I was having pain all over, that the blankets, at night, hurt my legs and feet. I told her that my hands hurt all over, not just in the joints. She asked several questions, then did the pressure points test. Uh yeah, those all hurt…a lot. So we talked for a while (she’s the best about talking, listening, and explaining things), then she told me that there was no blood test for fibromyalgia. She said, with everything I had told her, my answers to her questions, and the locations of the pain when she tested those pressure points, that I could add fibromyalgia to my list of ailments (my words, not hers). So we discussed various medications that we could try, the pros and cons of each of them. We decided to try Gabapentin first. I’ll admit, I was a little nervous about taking that particular medication. I’ve heard some real horror stories about the side effects of it. But I have been in so much pain, that I was willing to at least try it. One of the other things that sold me on the Gabapentin over the other drugs, was that it could possibly help with my sleep (lack of sleep is an entirely different blog post, let’s just say that I haven’t slept well for several years). So I picked up the prescription and started taking it. She started me on a really low dosage to see how well I tolerated it. I’m glad to say, no hallucinations! I didn’t notice a decrease in the pain for the first week. And it made me a little drowsy, but not enough to actually sleep well. We increased the dosage the second week and again the third week. 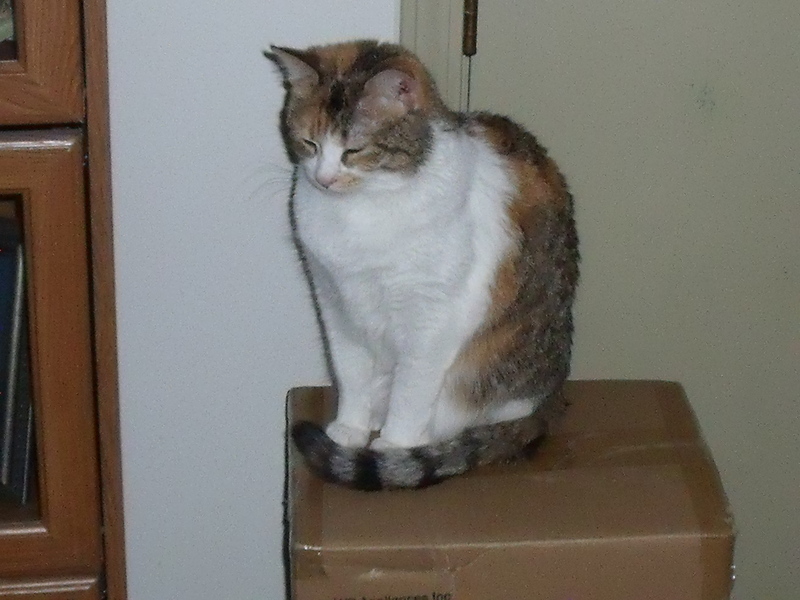 By the end of the third week, I noticed significant pain relief, but only for a few hours. I was also drowsy enough to sleep for a few hours. I called my rheumatologist after the third week to let her know how it was working. At that time, she doubled the dosage and instructed me to call her again after a month on this dosage. So the higher dosage does help me sleep better. I’m still awake several times during the night, but can usually go back to sleep fairly quickly. The higher dosage does help more with the pain, at least while I’m sleeping. I’m going to continue with this treatment and see where it takes me. If any of you have fibromyalgia (or RA, OA, or neuropathy), I’d be interested in hearing about how you cope. Good luck to us all with our treatment. Here’s to a relatively pain free day (I dream about those kinds of days.). A few years ago, I started using coupons and following all of these blogs about how you can save so much money by using coupons. I was able to get a lot of things for free or, at least, close to free. But (and you knew there would be a “but”, didn’t you?) now I’m trying to clean out my kitchen, organize, simplify, and minimize. I’ve slowly been cleaning out cabinets. Going through my dishes hasn’t been all that difficult as I tend to do that every year. Since I very rarely buy any new dishes (except for travel mugs/glasses for work…that’s a whole different blog post), I’m finally at a place where I don’t have a lot to get rid of. Now I’m tackling the pantry. Since I haven’t been feeling well (gosh, for what? Like the past three years? ), I’m just doing a little bit each evening while doing the dishes. I started on one shelf, took out boxes and cans, checking the expiration dates. I’m ashamed to admit how many cans of veggies or soup I’ve tossed because they were well past the expiration date. Anyhow, my method is to go through the items until I’ve found a minimum of five items to discard. Some days that’s pretty quick work. You know, I was so proud of myself for being able to save so much money when I was buying all of this stuff. But, honestly, how much money did I really save when I’m now pitching probably half of what I bought? I’ve learned a couple of lessons here. One, don’t buy so much processed food. Fresh is healthier and I tend to actually use it because I knowingly buy small quantities so it won’t go bad on me. Two, I’m not really saving money if the things I buy end up in the trash. Okay, make it three lessons. One person doesn’t need a lot. When you see all of those stockpiles people have created, it’s not meant for one person. I’m going to continue cleaning out the pantry. I don’t know exactly how long it’ll take to get it done, but I’ll eventually finish it. 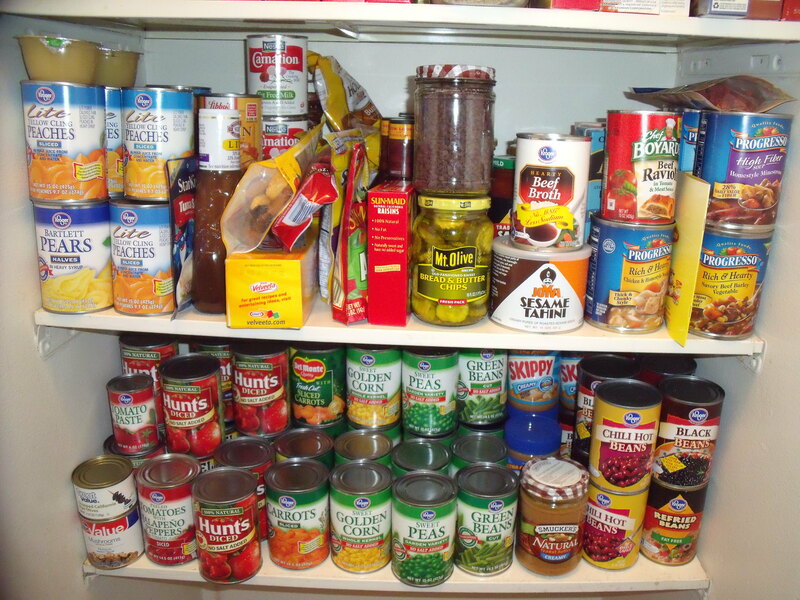 I’ll do a post later about my pared down pantry (hmm…I’ll have to remember that for the title). Do you buy more than you need and then toss a lot? I know a lot of folks say they do that with fresh produce, is that where you have issues? Or is it in other areas? Hold your horses there, cowpokes. 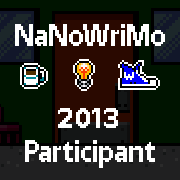 Camp NaNo is a tad more relaxed than the NaNo that takes place in November. I’m not going to commit to writing 50,000 words during the month of July. I don’t have to. What I am going to do is commit to writing a couple of short stories, no more than 10,000 words each. I’m thinking that’s a much more manageable task for me at this point in time. And, my hope is, this will get me back in the habit of writing on a somewhat consistent basis. That’s really all I’m hoping to get out of this camping session. Wish me luck. Or, better yet, join me. Where in the world is Patti the writer? I’ve not been doing much of anything, to tell the truth. Well, working. Sometimes. But, writing? Yeah, not so much. I come home from work exhausted and in pain. Most days, it’s all I can do to get the basics done. You know, dishes, laundry, feeding the cats, cleaning the litter. I tell myself I don’t feel up to writing. I don’t feel like sitting in front of my computer and trying to come up with something to write about. And I most certainly don’t feel like doing the actual writing. But, the thing is, writing has always been my escape. When I was younger, it was my emotional escape. Why in the world would I refuse to use it as a means of escaping the physical pain I’m in every day? I think, for most writers, the act of writing allows us to focus on something else. And I could definitely stand to direct my focus somewhere other than the pain. So why haven’t I been doing it? I’ve been feeling somewhat alone in this battle with arthritis. I’ve spent most of my adult life living by myself. For most of that time, it’s worked well for me. But lately there have been times when I find myself wishing I had someone here to help me out, to carry some of the load. Don’t get me wrong, I have amazing friends. Many of them have offered to help me out, to go to appointments with me, pick up prescriptions, and so on. And my step-sister is just the best. I know she’d do anything I need her to do. I’m having a procedure done on my shoulders next week. Originally, the doctor was going to do a more invasive procedure and I was going to need someone to drive me home. Kathy offered to do that for me. What I didn’t tell anyone was that they also told me I’d need someone to stay with me for 24 hours. That just seemed like such an imposition. So, what? I think I’m better than other people? That I’d do that for them, but wouldn’t give them the opportunity to do the same thing for me? Or that they would turn their backs on me when I needed them? Or that I don’t deserve their help? I don’t know. See? This is another thing writing does. It allows me to look at myself and try to figure out what in the world is going on. Why do I behave the way I do. Why am I so hesitant to ask for help? I know no one likes to have to ask for help. I know it isn’t easy for anyone. And maybe, just maybe, I don’t want to look too closely at my feelings, my fears, my desires. If I acknowledge those feelings, then I kind of feel obligated to do something about them. And it’s a lot easier to ignore them than it is to deal with them. 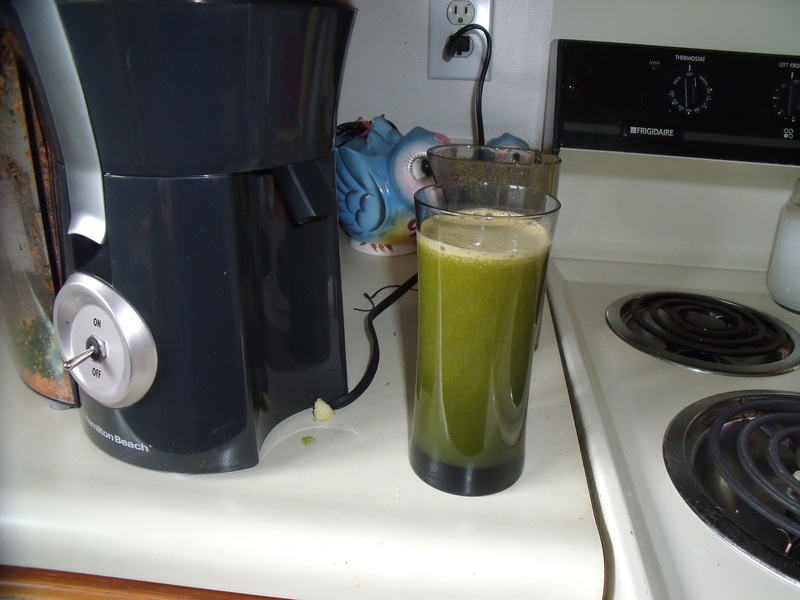 Not healthier, just easier…in the short-term. I think it’s time to get back to writing because I need to figure out how to live with this pain. I don’t want to just survive it. I want to be happy in spite of it. …and how could I have stayed away so long? Well, I’ve been at home and at work…oh, and doctors’ offices. Other than the grocery store, CVS, and Pet Smart, that’s just about it. Still not feeling great. I think the respiratory issues that have been plaguing me for several years have eased up. Could be all these crazy herbal concoctions I’ve been making and taking…maybe…Now if only I could find something to get rid of the pain. Yep, the pain is still hanging around. If anything, it’s getting worse. My PCP actually ordered x-rays of my shoulders (rheumatologist kept talking about it but didn’t do anything about it). The x-rays didn’t show anything really terribly wrong other than osteoarthritis, but I’m seriously wondering if an MRI would show something else. I need to sit down and do some research on this. I’ve had several folks tell me that their doctors have told them (you know, that whole “well, I heard it from her who heard it from him who read it in that article…”) that often x-rays aren’t the most reliable diagnostic tool for shoulder injuries. So, research before I see the rheumy in June is in order, I do believe. There are days when I have a very difficult time even lifting my arms. My PCP put in a diagnosis of frozen shoulder. When I read info about that, I can see how that would be a possibility. She put in an order for physical therapy. Three or four days a week for two or three months…yikes. When I called the insurance company to make sure it was covered, the lady on the phone was just so happy to tell me that it was. Good, right? Um…well…hold on a minute. When I asked what my fees would be, she told me $50. Alright, I can swing fifty bucks. Then something made me ask if that would be my total cost. Then she said, “Per visit.” Hold on, hold on…so we were looking at $150 to $200 a week for two or three months. No can do. I just can’t afford that. So I called my doctor back and told her. She printed out some exercises for me to do at home. I’ve been doing them, but honestly am feeling more pain now than when I started. That’s what makes me wonder if there’s something hidden that’s causing the problems. But I’m going to continue with the exercises my doctor told me about. After all, the initial physical therapy order was for two or three months, so I’ll give it that. In the meantime, I’m making a serious effort to eat much, much healthier. More fruits and veggies, less sugar (the aim is to eliminate as much sugar from my diet as possible as sugar seems to feed inflammation). I’ve been drinking herbal infusions…some pretty good…some, oh shall we say…not so good? I’ve always been interested in the healing power of food and herbs and my health problems have brought me back to seriously studying both. I feel like I’m learning a lot, but I’m being cautious to get information from several reputable sources. There’s so much out there that has no scientific backing and, while I’m not the pharmaceutical industry’s biggest proponent, I am a believer in scientific studies and findings. There are several herbalists who have been doing this for years and who combine their working knowledge of herbal remedies with the science behind why certain herbs are beneficial in certain situations. I’m even taking some classes and seminars…I’d lost track of how much I enjoy learning. Just wanted to update my pals (that’s you all) with what’s been going on and why I haven’t been around a lot. I’m definitely going to make the effort to post on a more timely schedule. Maybe not every day…heck, what am I saying? Definitely not every day, but at least a few times a week. So see you the next go-round. This is true for so much of our country…anywhere politicians have sold their souls so big business can operate unfettered by pesky regulations…anywhere citizens turn a blind eye to the corruption in the name of jobs…anywhere any of us see what is happening and turn away. We must channel our righteous indignation to bring about change. When you step into that voting booth, remember this, most politicians, most leaders of big business only care about us as a means to fatten their offshore bank accounts. Fight back…don’t give in…and don’t give up. I decided to get with it last night and quickly gather the 15 items I would need for today’s challenge. I walked back into my spare room, thinking I’d dig through the closet again. Then I saw one of the book shelves. Mmm hmm…I know I can find some books to get rid of. I went to the hall closet and picked up a plastic bag and headed back into the spare room. Of course, in my mind, I have been planning to sell some of my books, at least the ones that are in good condition. So I didn’t even look at those. 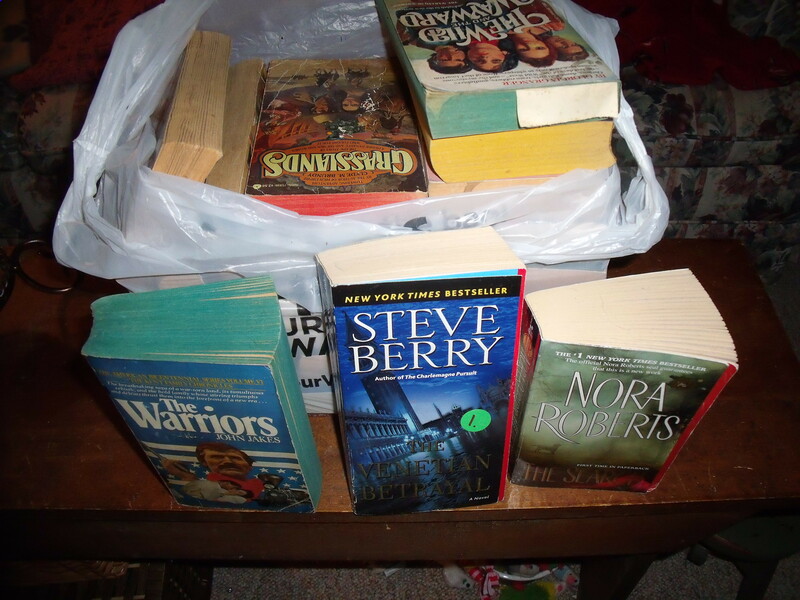 Instead, I gravitated toward the books I’d purchased used, deciding to make a quick trip to Goodwill with those. I didn’t even give this a lot of thought. Didn’t page through the books. Didn’t deliberate, didn’t question whether or not I might want to read each book again. I was quickly able to gather the 15 books I needed, then decided to go ahead and pick up another 10. A grand total of 25 books will be dropped off at Goodwill when I get off work today. Anyone interested in the number of items I’ve managed to let go of in 15 days? Well, I’ll tell you anyhow. In 15 days, I’ve eliminated 152 items from my home. Not too shabby, huh? Now in the interest of honesty, I didn’t even consider getting rid of books by my favorite authors. I don’t know about you, but I often reread books that I particularly like. How about it? Do you have favorite authors or books that you just won’t let go of?